Our cottage Smedjan is located on the hillside above lake Bunn. The terrace offers fantastic views over the lake and the whole area, yet the cottage is still less than 400m from the boathouse down by the lake. 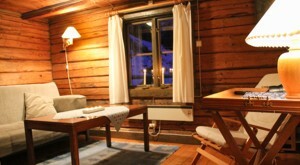 Enjoy your stay with friends or family, there is room for 4+2 people in the cabin. 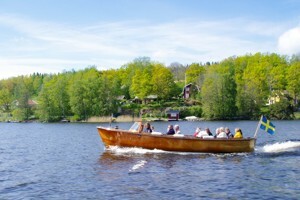 A row boat is already included in the cabin price. If you'd rather not row you can rent an extra electric or petrol engine from us. The petrol engine is rented on a first-come, first-served basis and since it comes with the larger boat(about 4,2m) it's worth being fast. 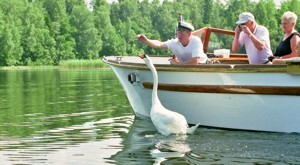 If you are not the first to rent, you can still use the electric engine and the slightly smaller (about 4,0m) boat. Thanks to the several thousand hectares of water the lake system Bunn, Ören & Kvarnsjöarna at our cottage Smedjan in Sweden is the perfect starting point for a fishing vacation in Sweden. depth charts are available here and you'll get the required fishing permit, engines for the boats and a local fishing guide from us. Less than 400m from the cabin, along a private road, you'll find our boathouse. The row boat included in the cottage rent is waiting here and this is a good place to keep your fishing gear. Would you rather rent a canoe or a kayak? No problem, please just ask us. Although the cottage Smedjan at lake Bunn doesn't have a sauna of its own, you can add our floating lake sauna as an extra and book it per day or week. 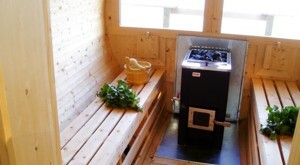 By using the lake sauna's boat engine you can roam the lake just as you wish. We have built a big window in the floating sauna so you can still enjoy the view of Swedish nature while sitting in the sauna. 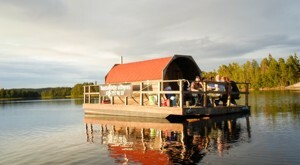 Just like the boats, the floating lake sauna will be docked at our boathouse by the lake. Relax on the terrace of the cottage for example while enjoying an evening barcebcuing and watching the sun set over the lake. 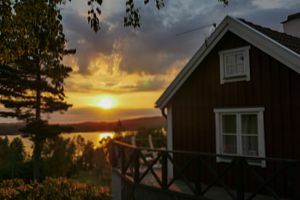 The terrace is directly connected to the kitchen of this cottage in Sweden with lake view and a barbecue is already here so all you have to bring is the barbecue coal. 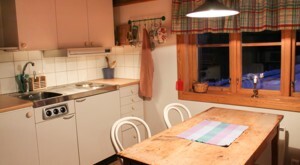 The kitchen of the cabin is equipped with a dining table, a beautiful old wood-fired stove as well as a modern stove with two electric stove plates, a refrigerator, small toaster oven, kettle, toaster, coffee machine, pots, pans, glasses, plates and all the necessary cutlery. The living room has a sofa bed for up to 2 people and has a cozy atmosphere thanks to the fireplace, wood paneling and the rustic style of the room. Even here you can enjoy magnificent sunsets over lake Bunn. Dogs are just as welcome to our cottage Smedjan in Sweden at lake Bunn as to our cottage Visthusboden. 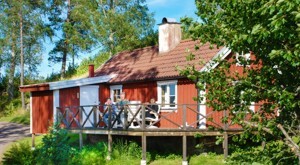 Both of these cottages are highly suitable for holidays with your dog in Sweden. As is customary in Sweden, neither of these properties is fenced in so your dog should be trained. Using a small ladder you can access the upper floor of the cabin Smedjan at lake Bunn, where you'll find the 2 sleeping nooks of the cottage. There are 2 single beds in the nook to the right of the chimney. 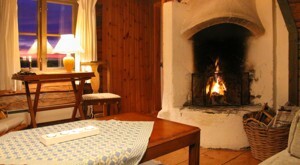 To the left of the chimney on the upper floor of the cabin is a double bed. 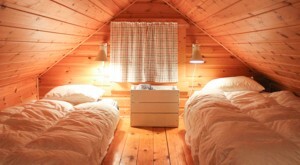 The two sleeping nooks are only separated by the chimney but are still in the same room. 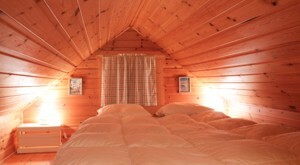 If you're traveling with 4 people we would recommend that 2 guests sleep in the living room and that 2 sleep upstairs. If you need more room, for example an extra bedroom or simply want more privacy you can book our small guest house, located about 50m away, as an extra (see Price list). The guest house is completely independent thanks to a bathroom with shower, a small kitchen and a bed for 2 people, but it can only be booked together with our cottage Smedjan or with our cottage Visthusboden. To the Pictures of the Guest House. During the cold season, the landscape around our 2 cottages in Sweden at lake Bunn becomes a winter wonderland with a lot to offer. 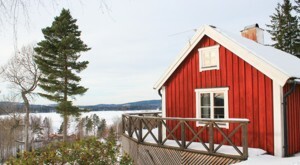 How about a winter holiday in Sweden with the whole family? You could choose from activities like sledding down to the lake, skiing, ice-skating or ice fishing for pike or zander. 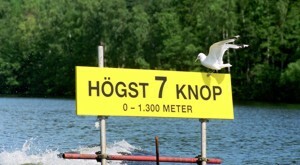 From June to August the landlord Captain Sigge offers guided boat tours through the mystical land of the trolls and fairies that have a connection to the canal and lake system. Hardly anyone knows this area as well as Captain Sigge, so on his tours you'll see the landscape through his eyes, with the stories and history that shaped it. 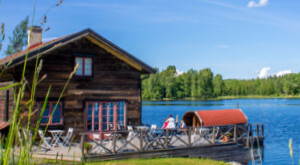 The gigantic lake system which surrounds the cottage is made up of the lakes Bunn, Ören and Kvarnsjöarna that are connected through many canals. Apart from fish species like zander, pike and perch and many non-predatory fish, birds and other animals also thrive in this area. Whether you are a beginner or already experienced with zander fishing - our local fishing guide Henrik Olsson clearly increases your chances of a getting a big zander, pike, trout or perch and adjusts the experience to suit your knowledge and wishes. Aboard Henrik's well-equipped boat with an echo sounding device you'll have everything you need. Fishing gear & coffee is included! 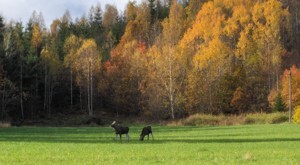 Both our cottages at lake Bunn are in a remote location, hidden in the green nature between the two lakes Bunn and Ören, in a region with many wild elks. Who needs an elk park in an area like that? Even though the cottages are off the beaten track it's still only 5 km to the popular summer town Gränna situated right on the lake Vättern. 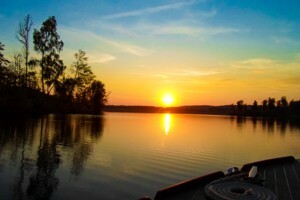 In the boat on lake Bunn facing the sunset you get peace, relaxation and nature - what more could you want? Whether from the cottage, in the boat on the lake or from our floating lake sauna, you can enjoy the magnificent sunset over lake Bunn. You can find all photos shown here in a larger version in our photo gallery. The days marked in red in the booking calendar are already booked by someone else. Please choose one of the vacant periods. 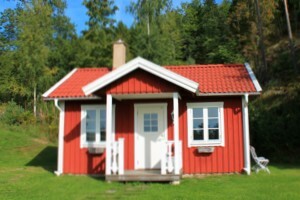 If our cottage Visthusboden should already be booked please see if our other cottage at Lake Bunn is still available during your requested period or take a look at the booking calendar for our other lakeside cottages in Sweden. You might not think of Sweden at first when hearing winter holiday but Sweden has a lot to offer in the winter. 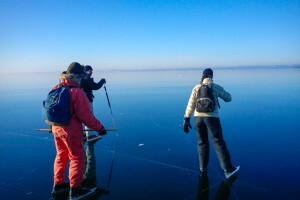 You could go skating on the vast and frozen lakes, skiing, ice fishing, watch an ice hockey game with the whole family and all this while experiencing a white Christmas. So how about a real winter adventure and winter holiday in Sweden with the whole family? Arrival on Saturdays after 3 pm. Departure by agreement but at the latest on Saturdays 10 or 12 am. Dogs are very welcome to our cottage, but please mention this in your booking request! Other periods, arrival & departure days or times are only possible on request. Bed sheets can be rented on request, but please bring your own towels. Smoking is not permitted in our cottage! You can still smoke outside the cottage, but we kindly ask you to gather the cigarette butts in an ash tray.